Welcome to High View Clay Shoot, a family owned/operated quality clay shooting ground set in the beautiful rolling Cornish countryside just 10 minutes drive from Launceston and the A30. The shoot is owned by Bill and Donna Gregory, both keen ‘guns’ and we are only a 45 minute drive from either Exeter, Plymouth or Truro. High View is a full Registered Clay Pigeon Shooting Association (CPSA) ground where shooters shoot from a variety of portable shooting stands such that we can provide you with a wide range of shooting challenges. We specialise in ‘English Sporting’ (ESP) presentation, that is clay flights that in general simulate the movement of game so come along and see the many varied clay flights across our lakes, through woods and fields that present a challenging mix of simulated teal, rabbit, pheasant, pigeon and woodcock/snipe though differing aspects of our ground. A feature of High View many like is the variety of angles and directions throughout the shoot where you may shoot either side of a broad track on our circuitous layout so the wind/sun can be affecting you from a variety of relative directions – you will not be bored! The 43 acre ground is equipped throughout with modern, fully automated traps to ensure maximum consistency and quality of targets. Target presentation is varied and is aimed to be enjoyed by everyone, including the keenest enthusiast and the more casual shooter alike with the guidance “challenging but fair” being the instruction to our Course Setters. 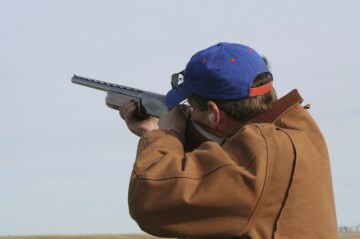 We keep the degree of difficulty such that the less able shots can go home with a reasonable score but even the best will leave some clays untouched. To date no shooter has scored 100 out of 100 at High View (now there’s a challenge!) nor seen a long-face on a novice! Catering is available on all shoots using locally sourced farm shop produce to provide promptly made light meals and drinks to enjoy under cover before or after your shoot. Arrive early to start the day with a hearty cooked breakfast to enjoy in the warm by our log-fire in our newly constructed Clubhouse with seating for over 50 guns! No one needs to leave High View hungry. Plastic or fibre wads are acceptable but please note that out of consideration for our neighbours the maximum load permissible is 28 grams (you all know you can zap ’em with that load) so kindly please respect this as a consideration for everyone’s enjoyment of our lovely countryside. We regret that cartridges are NOT are available to purchase on site as we would ask that ‘Guns’ come with all their own equipment as we are focusing on providing you with a fair but challenging shoot in safe and comfortable surroundings. Safety is paramount to us and we have a number of CPSA qualified Safety Officers as helpers, one of whom will always be in attendance during CPSA Registered shoots. View our Facebook page for an up to date schedule and timing of events as well as on this site. Come along to High View – Great location, great shoot. For more info just contact us.